With years of releases under their belts, this single 12 inch is guaranteed to rock anything! 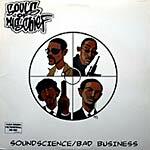 Dope tracks with a remix of Soundscience. Produced by Evidence, Babu, A-Plus, and Tommy Tee. Cuts by Babu. Lyrics by Souls of Mischief.